A major milestone — a new central utilities plant — was recently completed on the medical campus of the University of California San Diego in La Jolla. UCSD and the construction management firm Kitchell finished a replacement two-story, 40,000-square-foot plant to provide power to the new hospitals and future medical facilities. "The central utilities plant feeds all of the utilities, in this case to our hospitals, Thornton Hospital and the new Jacobs Medical Center tower,” said Dee Davis, consultant and project manager for UCSD. The $70 million central utilities plant is equipped with day tanks that supply fuel to the generators. The plant also has four emergency power generators; two 35,000-gallon underground backup fuel tanks; and a 3,000-square-foot underground utility tunnel to connect mechanical piping to Thornton Hospital and the Jacobs Medical Center tower, under construction. The chiller room has 3,800 tons of cooling equipment, including two 1,300-ton Trane chillers and a 1,200-ton relocated York chiller. There is also a command center where a team monitors the entire plant 24 hours a day, including the chilled water system, emergency power and fuel oil system. “What we tried to accomplish with the new central utilities plant was to incorporate top-of-the-line, high-efficiency equipment; blend the facility with the environment so it’s not an eyesore; and build it so that we could expand it for future growth,” said Brandon Potts, senior project manager for Kitchell. The central utilities plant will power 900,000 square feet of hospital space, with the capability to power an additional 1 million square feet of future medical facilities. 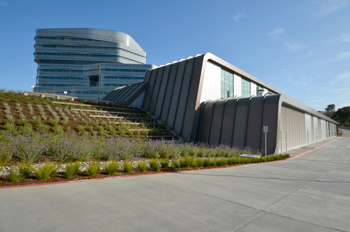 The central utilities plant meets LEED Silver certification from the U.S. Green Building Council, based on its design and the way the facility blends with the environment. The designation is pending review. The plant was able to receive condensation from Thornton Hospital and the Jacobs Medical Center tower to be recycled and reused, seven months earlier than originally planned. The result was more than 4 million gallons of softened water. Davis said this was a major accomplishment. "So when we were working on the Jacobs Medical Center, which is still under construction, the central utilities plant was already online,” Davis said. UCSD and Kitchell did not want to use old techniques in the construction process, wasting water and the potential to create energy earlier in the process. In the past, construction teams would typically drain the condensation during construction and not recover it until closer to the end of the project, when steam loads are larger. “So we challenged the team to come together and come up with a solution to recover the steam condensate earlier than planned,” he said. Thornton Hospital and the Jacobs Medical Center tower are now returning condensate to the central utilities plant to be recycled and reused in the system instead of dumping it down the drain. This was a coordinated effort among Control Air, University Mechanical, Spira-Loc, Kitchell and UCSD Facilities Engineering staff. The project took about 27 months to complete and was finished 27 days ahead of schedule.